I just realised that it’s been a while (over a month) since I last posted an updated of the endless embroidery. 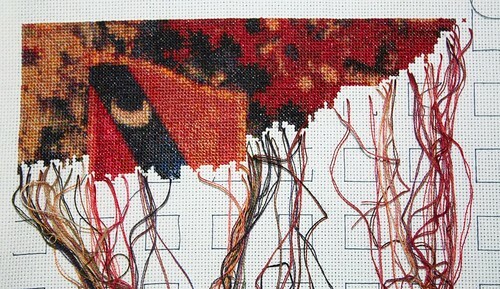 I started this piece on Nov. 23, 2009, and have worked 4686 stitches out of 130,380. Almost 3.6%! The set of progress photos is posted on Flickr. I saw the original tapestries when I was backpacking through France while in grad school, years ago. This entry was posted on March 3, 2010 at 9:59 am	and is filed under Crafts, embroidery. 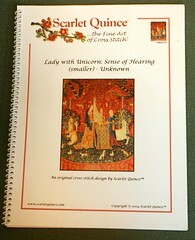 Tagged: counted cross-stitch, cross-stitch, embroidery, lady and unicorn, unicorn. You can follow any responses to this entry through the RSS 2.0 feed. You can leave a response, or trackback from your own site.